Bold wall treatments are a growing trend in 2017, and for good reason. Walls offer an ample background for decorative elements that can make a statement and instantly change the vibe and mood of a space. But rather than using heavy materials to achieve an aesthetic combination of color, texture and light reflections, many designers today seem to gravitate towards light wall treatments, such as wall graphics and murals. 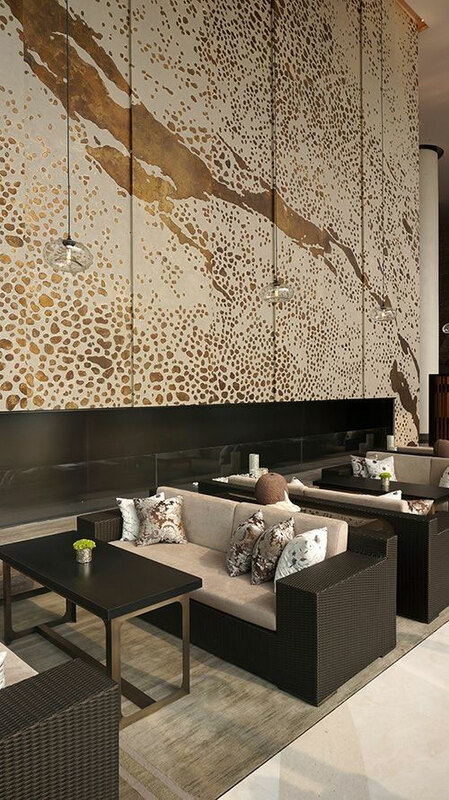 At the Grand Hyatt Dalian, on the Xinghai Beach in Dalian, China, splashes of gold on a light background capture the artistic potential of color beyond the limitations of clear shapes. Designed by Beijing-based Dragon Pace, this wall art has an innate spontaneity and freedom that balances the strict geometry of the modern furniture. 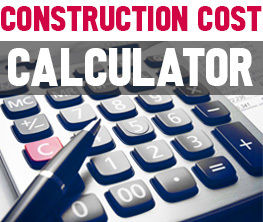 Large wall graphics can serve as more than just decorative elements. They can turn into much needed visual stimuli, as it happens with the colorful illustrations by James Gulliver Hancock on the walls of the Commonwealth Bank offices in Melbourne. 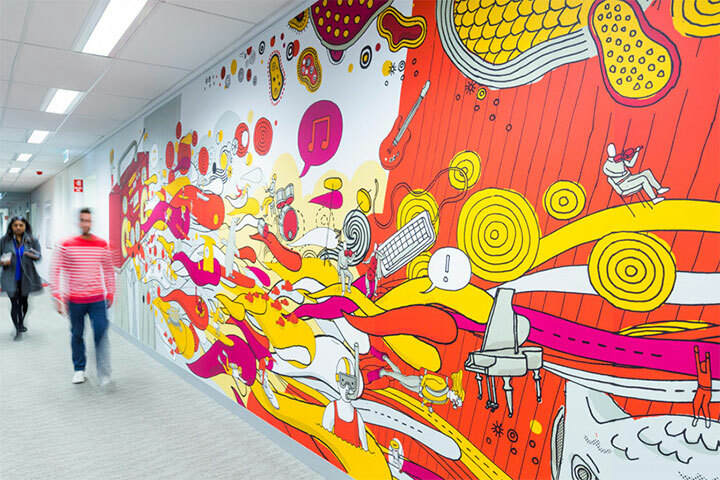 Here, the vibrant wall art offers an escape from the routine and monotony of the office work. 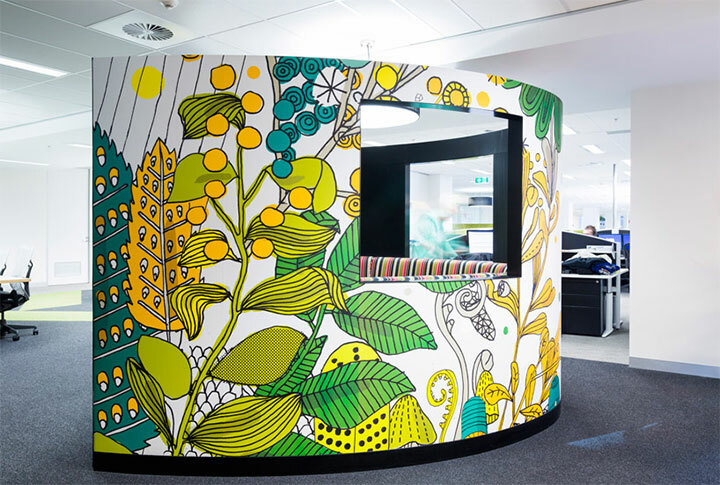 Created by Sydney-based Frost* Design in collaboration with Davenport Campbell, the interior uses these exuberant illustrations to differentiate between work and break-out areas by using different themes. 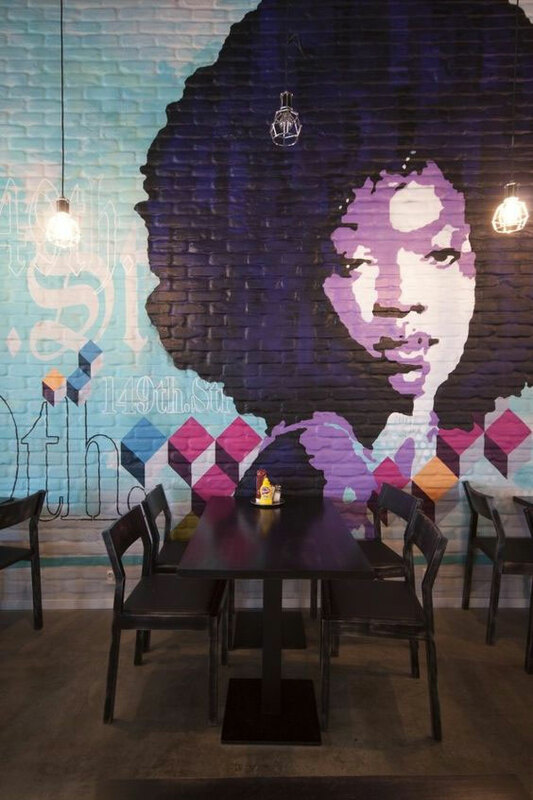 Murals create ambiance and define the purpose, the history and the feel of a place, as in the case of Juha Lahtinen and Samuli Suonperä’s artwork in the Chico’s restaurant in Espoo, Finland, redesigned by Amerikka Design Office. Telling a story is what well-design spaces attempt to do. 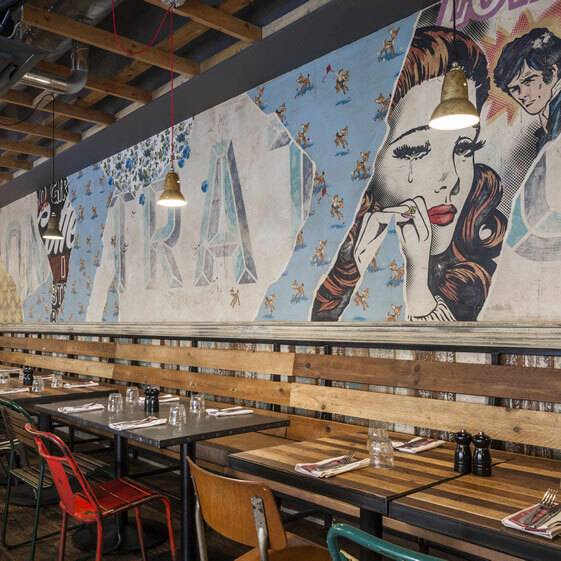 When it comes to the Jamie Oliver restaurant in London, designed by Blacksheep, it is the walls that tell the story. Finally, the wall treatment can be as simple as the logo of a restaurant and as large as a whole wall, as in the case of this sea-inspired graphic inside the Alcomar Mexican seafood restaurant in Austin.